In 1943 the Vice Chancellors of United Kingdom Universities convened a special commission to “consider the principles which should guide the promotion of higher education, learning and research… in the colonies.” The recommendations of that commission saw a Royal Charter formally establishing what was then the University College of the West Indies in 1948. The University of the West Indies which today boasts of being one of only two regional higher education institutions in the world began with one campus (Mona, Jamaica) at the historic Gibraltar World War II Camp acquired at a cost of £12,000. In 1960 The UWI’s second campus at St. Augustine was born out of a merger between the University College and the Imperial College of Tropical Agriculture (IATA) in the island of Trinidad. The two campus College remained affiliated with the University of London until 1962 when it became The University of the West Indies, an institution in its own right with the privilege of granting its own degrees. What is today known as The Cave Hill Campus of The University of the West Indies started in 1963 as the College of Arts & Sciences in temporary quarters at the Bridgetown Harbour. On October 16, 1967 the College of Arts and Science at Barbados opened the academic year at the new university buildings at Cave Hill, on a 45 acre site provided by the Government of Barbados. With the establishment of the Faculty of Law in 1970, the name of the Caribbean College was changed to the Cave Hill Campus of The University of the West Indies. The UWI’s fourth and newest Campus, the Open Campus was formally launched in June 2008 in Antigua and Barbuda. The Open Campus is an amalgamation of the previous Office of the Board for Non-Campus Countries & Distance Education (BNNCDE), the School of Continuing Studies (SCS), the UWI Distance Education Centre (UWIDEC), and the Tertiary Level Institutions Unit (TLIU all of which are direct descendants of the Department of Extra-Mural Studies. The UWI Open Campus offers multi-mode teaching and learning services through virtual and physical site locations across the Caribbean region. There are currently 42 site locations of the Open Campus in the region, serving 16 countries in the English-speaking Caribbean. 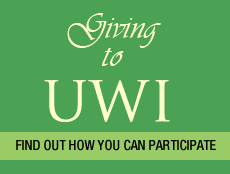 Today, UWI is the largest and longest standing higher education provider in the English-speaking Caribbean. UWI offers undergraduate and postgraduate certificate, diploma and degree options in Engineering, Humanities & Education, Law, Medical Sciences, Pure & Applied Sciences, Science and Agriculture, and Social Sciences. As an icon of Caribbean integration and culture, UWI remains committed to enhancing every aspect of Caribbean development and improving the well-being of the people of the Caribbean. To advance education and create knowledge through excellence in teaching, research, innovation, public service, intellectual leadership and outreach in order to support the inclusive (social, economic, political, cultural, environmental) development of the Caribbean region and beyond. By 2017, the University will be globally recognised as a regionally integrated, innovative, internationally competitive university, deeply rooted in all aspects of Caribbean development and committed to serving the diverse people of the region and beyond. The Core Values of the UWI that guide its mandate, policy and decision making include integrity, intellectual freedom, excellence, civic responsibility, accessibility, diversity and equity.